October 2017 – We've Moved! We are so excited to share our first Five Things Friday that includes yoga poses that YOU can do on your own complete with photos and videos. From sitting in long rehearsals or standing up when performing or teaching, we all can benefit from these poses so we really appreciate Dr. Kate Umble Smucker for writing and sharing these with the Brass Chicks community and special thank you to Rebecca Steinberg for modeling for the pictures! Dr. Kate Umble Smucker is a trumpet player and music educator based in New York City. She currently plays with Calliope Brass Quintet and teaches trumpet at the Music Conservatory of Westchester. Kate is also a 200 hour registered yoga teacher. She is passionate about sharing her knowledge of yoga with fellow musicians so they too can experience the benefits she has enjoyed by incorporating yoga practice with trumpet practice. o Head: Your skull “floats” on a ball and socket joint. Slowly and gently trace an infinity sign with your chin. Can you feel a length in your neck and free and easy movement through the whole movement? If not, take a pause at the spots where you feel tension and breathe in and out through your nose for a few breaths as you release the tension in those spaces. o Shoulders: Bring your shoulders up to your ears, roll them back to squeeze your shoulder blades together and then bring them down away from your ears. Do this a few times until you can feel the weight of your arms hanging from your shoulder joints and a length across your body from the top of one shoulder to the other. This simple stretch can be done any time during practice or a rehearsal break. Simply stand behind a sturdy chair and place your elbows on the back of the chair. You can rest your forehead on the back of the chair between your elbows or, if you are open enough, you can let your head drop between your elbows as you see Rebecca doing in the photo. Be sure to walk your feet out and away from the chair so you ankles are directly under your hips to give you a flat back (no sway back or arched back). Hold for several minutes, breathing deeply and out through your nose, making sure you don’t lock your knees. Many of you have probably come across this one before, but I had to add it into the mix because it works so well! Standing or sitting, bring your arms out to the side so you are in a T shape and then bring your elbows together in front of your body, crossing your right elbow over your left elbow. If it is available to you, bring your left fingertips to meet your right palm so your arms are twisted around each other in a spiral. You should feel a stretch across the back of your shoulders. Be gentle! If you want a deeper stretch you can pull your elbows down and/or out away from your body. ** Do this on the other side by releasing your arms and crossing left elbow over right elbow. This is a simple forward fold, folding forward from the hip joint, staying balanced on the four corners of your feet. Bend your knees as needed to feel the lengthening of your spine. The neck and shoulder release is created by adding downward weight when you clasp your elbows or, (if available to you), placing your palms under your feet. Hold this for at least a minute, longer if possible, concentrate on breathing in and out through the nose, and come up slowly when you are ready to release. This twist is less intense than what you might do during a yoga practice because you should be properly warmed up before you jump into a really deep twist. Keep that in mind as you do this at the wall! Place your chair about 1-2 feet from the wall and stand beside the chair, between the chair and the wall. Place your right foot on the chair. Keeping your right knee above your ankle, turn your torso to face the wall and reach your left arm straight out along the wall. You can reach your right arm up or straight out in line with your left arm. Repeat twist on the other side, placing your left foot on the chair. We are excited to continue to interview trailblazing female musicians who continue to push boundaries and inspire musicians everywhere. This group has been on my radar for a while and it was so great to hear from Mireya from Mariachi Flor de Toloache – about her experiences with the group and changing the musical landscape. 1. 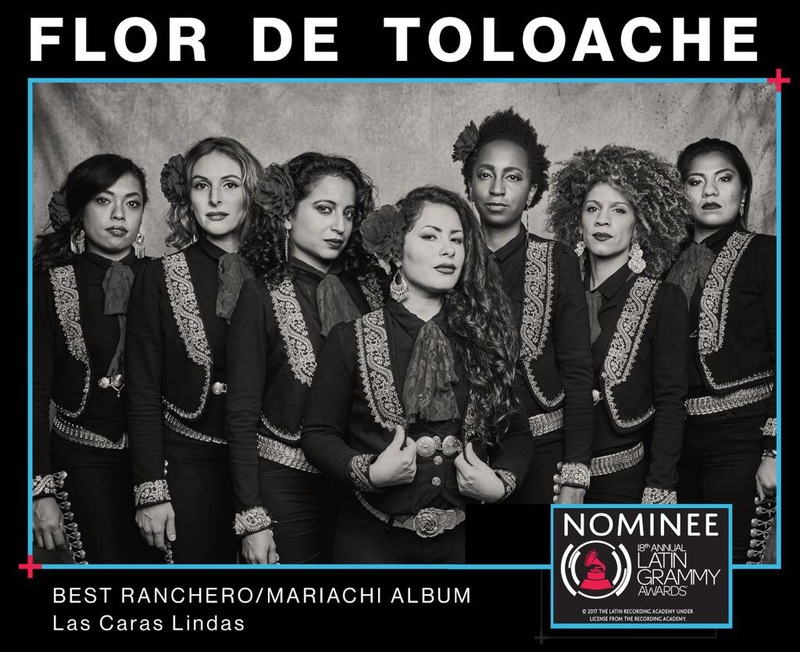 From the Latin Grammy nomination to the upcoming and recent tours, Mariachi Flor de Toloache is extremely impressive as NYC’s first and only Mariachi group. Tell us about your experiences! Anything coming up soon? It has been quite a beautiful and empowering adventure. We started in 2008 knowing we wanted to experiment with the tradition of mariachi which had been passed down by my dad. Little did we know that by being persistent, playing for tips, playing in the subway in the middle of winter, dealing with much criticism for not following the tradition as is, it would all lead to being nominated for our first self produced album then recently nominated again for our second album. It’s definitely mind blowing how much you can accomplish when you’re persistent, true to yourself, passionate and follow your vision. More important than the recognition of an award, is the continuous inspiration we spread to young girls and boys. Seeing them singing along to our songs and connecting to our music is priceless! This week’s Five Things Friday is by trumpeter and educator Sandy Coffin. I have known Sandy through freelancing in NYC and my recital at the International Women’s Brass Conference was right around the same time as her presentation so it is great to feature Sandy’s presentation with the Brass Chicks community in this format. Sandy Coffin is trumpet player who has performed all around the US and Europe, premiered several new pieces written especially for her, presented lecture-recitals on original 19thC instruments in both the UK and NYC this past year, is working on a recording project of ‘lost’ cornet solos, teaches Brass Band at a private school in NYC, tutors with the National Youth Brass Bands of Scotland Summer Course, has won a bunch of awards, created a successful concert series, just signed an arranging contract with a music publisher, has degrees from Oberlin and MSM—and still isn’t sure what to wear. Based on my presentation at the IWBC June 2017 at Rowan University and my interview with Christine Chapman, published in the Fall 2015 IWBC Newsletter. As women, we do not have a ‘default’ dress code; we do not have a standard equivalent to the ‘suit and tie.’ Women have a particularly wide range of fashion options when the dress code says ‘formal,’ but each option carries certain connotations. The choices have become increasingly complicated for everyone, both women and men, so how do we go about making informed and appropriate choices? I think it is important, especially in these complex times, to talk about some of these issues, and particularly about how we choose to physically present ourselves in our performances, photos, and social media / publicity materials. I don’t believe there are any definitive answers, but hopefully talking about these things can help us all make educated choices – and allow us to excel in our performances. Can I actually play my best in this outfit? Whatever you choose to wear, be sure you can breathe easily and fully, and can move as needed – to get on and off stage, for mute changes, instrument switches, page turns, choreography, managing interactive electronics, etc. Practice often in the outfit to be sure. Video record yourself from various audience perspectives to be sure you are really presenting the image you want to project. Be informed about the performance space and audience sight lines. You don’t want to be surprised by the angles people are looking from – and what they can see. Keep them focused on your performance, not your wardrobe. How do our clothing, hair, make-up choices impact how others perceive us (the individual and/or ensemble)? Be aware of the story you want the audience to experience during your performance. You are not anonymous while producing sound on a stage. Wearing a cocktail dress and heels just because it seems to be the female equivalent of a man’s suit (performance uniform) without being aware of the cultural signals such an outfit projects can be inappropriate on stage. Be aware that different regions bring different cultural norms to the table. You don’t have to change yourself to fit, but you always need to be as aware as possible of the context others will have as they interact with you. How do they impact how we perceive ourselves? Self-perception is an integral part of performance presentation. Do you feel comfortable? Exposed? Powerful? Vulnerable? You don’t want to be focused on what you are wearing – you want your energy to go into your performance. Learn what styles make you feel most in control of the situation, strong, and secure. Determine what brings you closest to your own self-image of a successful performer. What factors can we use to determine what the consequences of our clothing/appearance decisions might be? Stay aware of the signals that some clothing was designed to project. Educate yourself. Talk with theater costume designers or fashion professionals. Aim for PERFORMANCE POWERFUL. It is great when a performer is aware of how an outfit can be perceived, including the hidden signals that may have little to do with the music, and intentionally chooses to present themselves in that framework because it makes them feel strong. Clothing choices that seem to be made in the hopes of distracting from performance difficulties are less great. Get feedback from others about your performance presence, but reflect on what makes you feel good on stage. You need to feel solid and grounded, strong and powerful, so spend time reflecting on what makes you feel best. When you feel solid, grounded, strong and powerful, the audience will join you in feeling that. You must own the story that you are presenting to the audience. Tell that story as powerfully as you can. Clothing and makeup choices should serve as backdrops or props in the telling of that story, not simply a costume for yourself. Keep it all integrated. Remember that others are going to bring their own agendas and interpretations to that story. Plan in advance for what those might be, based on cultural allusions, your own experiences, and research into the experiences of others. You can’t control other people’s responses or behavior, but you can prepare yourself in advance on how you would deal with a variety of responses. “What’s Up With That Anyways? : Conversations with Christine Chapman” by Sandy Coffin. NoteWorthy, Official Newsletter of the IWBC, Vol. 22, No. 2, Fall 2015, page 5. We are excited to continue our new series featuring women brass players who push boundaries and play outside the box of a standard path for a “conservatory trained musician.” Our first interview features trombonist Natalie Cressman, whom Kate has met freelancing in NYC and it was such a pleasure to read her responses. Possessing a voice as cool and crystalline as an Alpine stream, Natalie Cressman is a rising singer/ songwriter and trombonist who draws inspiration from a vast array of deep and powerful musical currents. Her new five-song EP Traces reveals her latest evolution, a sleek and sensuous electronica-laced sound with even a trace or two of dance floor sweat. Steadily evolving in many directions, the 25-year-old Cressman has already put down deep roots in several overlapping scenes. A prodigiously talented New York City-based trombonist, she’s spent the past seven years touring the jam band circuit as a horn player and vocalist with Phish‘s Trey Anastasio (and recently played with Phish at Madison Square Garden). Deeply versed in Latin jazz, post-bop, pop, and Brazilian music, she tapped the interlaced traditions on her first two solo albums, 2012’s Unfolding and 2014’s Turn the Sea. The Traces EP follows on the heels of 2016’s Etchings in Amber, a gorgeous duo album with guitarist Mike Bono that introduced Cressman as a formidable musical force without her horn. While the project focuses on songs featuring lyrics she wrote for several Bono compositions, Cressman also wrote words and music for three of her songs, contributing to the atmospheric suite of jazz-inflected, genre-bending tunes. With Traces, Cressman expands her creative reach into post-production, meticulously crafting soundscaped tracks. Her vocal work in increasingly intimate and rhythmically insinuating settings has revealed an artist who can thrive in any setting, from raucous, reverberant halls to packed and pulsing lofts and nightclubs. In an epoch marked by infinite musical possibilities, Natalie Cressman is a singular force who draws from an improbable breadth of sonic realms. Cressman is An artist endorser for King Trombones. 1. From your background in jazz and latin music to playing in the jam band scene with Phish and Trey Anastasio band, it certainly seems like you are a well rounded musician. How did you get started with your own work as a composer/singer-songwriter? For this week’s Five Things Friday, we are pleased to welcome Ariana Douglas! Ariana, a horn player, is a graduate student and freelance musician in Toronto. Thanks to Ariana for listing her five favorite fifth symphonies for us! This post from tubist Genevieve Blesch has some great tips on how to keep your playing up after graduating and even features a bonus Five things to cover in each practice session. Genevieve Blesch is a freelance tuba performer and educator in the tri-state area. After spending her freshman year at The Ohio State University studying with James Akins, she received her bachelor’s degree in music education and master’s degree in tuba performance from Mason Gross School of the Arts at Rutgers University, where she studied with Alan Baer. Genevieve frequently performs with orchestras, quintets, school ensembles and marching/pep bands. Noteworthy clients include The Pennington School and Patriot Brass Ensemble. Genevieve teaches private and small group lessons in central New Jersey. Orchestras that Genevieve has performed with include Shen Yun Symphony Orchestra, Ridgewood Symphony Orchestra, Sinfonietta Nova and Gateway Classical Music Society. Outside of music, Genevieve teaches Japanese and pursues her interest in technology.